The leaves are starting to turn, ski shops are busy stocking up with new merchandise, the new gondola at Stratton is being installed with the plan to take the first riders up on September 27. The real estate market is picking up! In July there were 4 pending sales, and in August there here were 24 Sales in the Stratton area. Follow this link to see the August market activity. Out office is busy with with offers, contracts and winter Stratton rentals. Our short term Stratton rental staff are very busy with phone inquiries and are booking Christmas as well as MLK weekend. Properly pricing a home will get it shown and sold. We closed a property in Londonderry for $630,000 last week. Here is what the seller had to say, "I Peggy and I wanted to thank you all for your effective and professional representation. I do appreciate having had a great team to help us close this interesting transaction. Hope to say hi on Monday or Tuesday before we leave." A very special property has just had a major price reduction to generate a sale. This custom home is miniutes to Stratton mountain and is spectacularly sited on the east side of Cole Pond. Great sunsets over the pond. The home has a chefs kitchen with Aga stove and more. Living room has an antigen mantle over the woo burning fireplace. There are french doors to a large deck from the living room and dining kitchen area. There are two master suites, a darling bunk room, crows nest bedroom and additional family room, studio etc with full bath over the attached garage. It has many unique architectural details. Reduced $150,000 to $49,000. Now is great time to buy Stratton Real Estate as there are many well priced properties which are available for this winter occupancy. If you are thinking about a Stratton rental, don't delay! 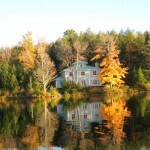 All our available seasonal rentals are on our website, www.winhallrealesetate.com. Please call us for any additional Stratton area inforation.